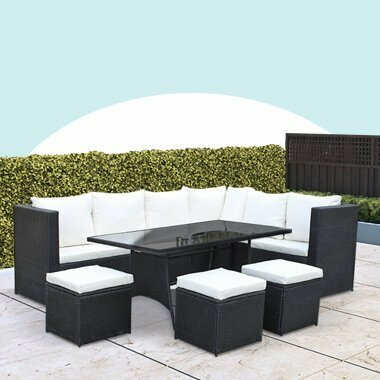 Rattan garden furniture, especially when polyethylene rattan, is a high quality, durable material for outdoor furniture, which can withstand harsh weather conditions. However, we still recommend providing protection for your outdoor furniture when it is not in use. This is as you will be able to have the reassurance that your patio furniture will be in a suitable, useable condition when the sun begins to shine and you are ready to use it. One way to do this is by purchasing a protective cover. We provide outdoor furniture covers designed with our products in mind. For instance our table covers are available as either polyethylene (PE) or polyvinyl chloride (PVC) which are both waterproof, and UV resistant. Therefore protecting your garden patio furniture against the sun, various weather conditions as well as the odd wild bird or two. Rattan garden furniture covers are one of the easiest ways to protect the furniture sitting on your garden patio. No matter if it's a rectangular furniture set cover, rattan cube set cover, bench cover or simply a garden patio furniture cover. Providing patio furniture covers can ensure your outdoor garden furniture is protected all year round. The furniture set cover securely fits onto the relevant outdoor furniture thanks to rust proof eyelets that allow you to tie the cover to the furniture itself or to secure it to something else on the floor. Ideal if wind is a concern, as the cover is unlikely to blow away if secured properly. And, our covers are also UV-resistant meaning the cover is unlikely to fade in colour when placed in direct contact with sunlight for a long period of time. Rattan furniture covers are suitable for all types of rattan garden furniture and can be available as cube set covers, seat covers, chair covers, sofa covers and more. And, applying a cover to your furniture allows you to forget about the rattan garden furniture until the moment comes when you want to enjoy it.